Alligator hunting season opened recently throughout much of the south with hopeful hunters out there searching for the biggest lizard kings they can find. It only took a couple of Alabama gator hunters a half hour to bag a 920-pound monster. Jeff Gregg and his son Justin and a long-time friend made the kill on Lake Eufala using a guide. Gregg told the Dothan Eagle they had only been on the lake for about a half hour when they spotted the beast. The gator measured 13-feet, 6 inches. In year’s past, the father and son had attempted to obtain a hunting permit, but to no avail. The state of Alabama issues permits by means of a lottery. 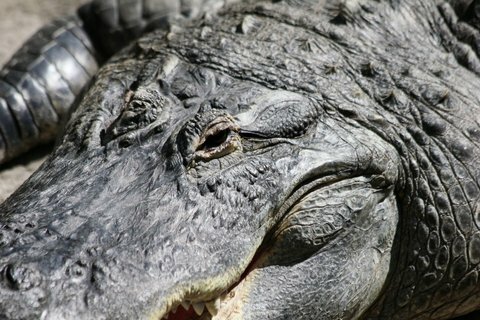 Sanctioned alligator hunts must not use firearms. The hunters in this case “snagged” the gator with a three-pronged hook attached to a fishing pole. After the escaping the group caught up to the gator and snagged it again. Several harpoons and a 5-inch knife finally dispatched the beast. With the remains of the gator, the hunters plan to make jewelry out of the claws and teeth, use the meat and have the full body stuffed and mounted.